A statue of Confederate Gen. Robert E. Lee stands at the center of Lee Circle along Monument Avenue in Richmond, Va. 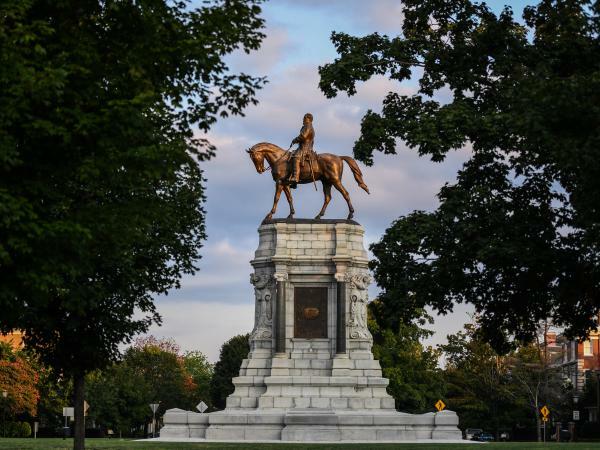 The commonwealth of Virginia has a complicated racial history that underpins many of today's political controversies. "The system of enslavement that we know in America really was born here," said historian Gregg Kimball with the Library of Virginia. "You don't overcome a legacy like that overnight," Kimball said. "And even though we see advances in terms of different people that have different ethnicities and races serving in politics, there's still this undertone." Richmond is a walking tour of American history: Thomas Jefferson designed the Capitol building, the White House of the Confederacy is located here, and it was the site of one of the nation's busiest slave markets. Yet there has been a concerted effort to move from Old South nostalgia to telling the broader story of Virginia's history. The American Civil War Museum in Richmond, Va., creates a space to bridge Virginia's past and present. The American Civil War Museum, which operates the White House of the Confederacy and a museum at Appomattox, is creating a new space along the Richmond riverfront expected to open later this year. 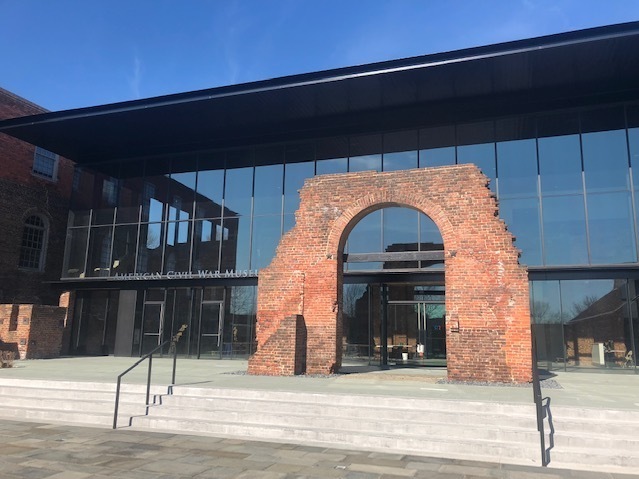 It's a modern glass structure built around the brick ruins of the Tredegar Iron Works, which once supplied the U.S. Navy and the Confederacy. "We really wanted to create a space where immediately coming into it you see this connection between past and present," said CEO Christy Coleman. 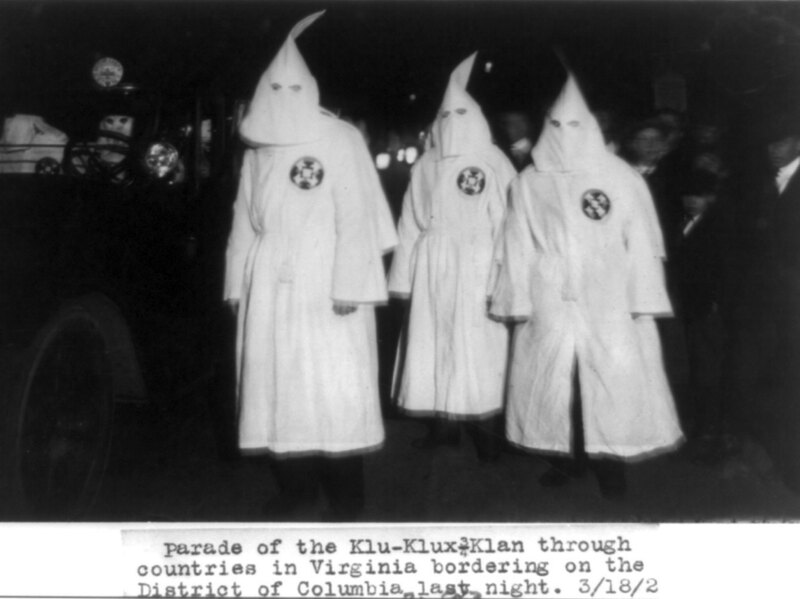 A Ku Klux Klan parade through counties in northern Virginia in March of 1922. An image in Virginia Gov. Northam's medical school yearbook shows someone wearing KKK garb, leading to many calling for his resignation. "Those images, even if they're 35 years ago, still have a real power and they have an ugliness," Coleman said. "Because they're both tied to a form of domestic terrorism that the nation still deals with, right?" But Republican state Sen. Richard Stuart, a friend, came to his defense. "I think we need to give him the chance to stand up and work through this and I think that in the long run can be very helpful to the commonwealth and the country," said Stuart. He said poor judgment years ago should not outweigh Northam's service given that racial attitudes in rural Virginia at the time were far different than they are today. The head of the state's Republican Party is not buying that defense. "If you're in your mid-20s dressing, in blackface or a KKK robe, that's a little bit beyond youthful indiscretions at that point," said Jack Wilson, chairman of the Virginia GOP. Herring came forward on Wednesday to acknowledge that he, too, had worn "brown makeup" at a college party in 1980 to impersonate a popular rapper. Northam has said he's not in the photo after first indicating he was. Regardless, Wilson said Northam should resign so the state can move on. He likens the situation at the Capitol today as a "power vacuum." "This is our history and it is part of who we are," Gray said. "We need to figure out how to reconcile it." Gray, who is biracial, said that although she's disheartened, she's hopeful that talking honestly can help move the commonwealth forward. "We're a strong community of people. We do love each other," she said. "The vast majority of us are not racist, but we have to come together and we have to embrace each other." As for the governor, Gray said she doesn't see how he can remain in power because he can no longer be a unifying force.